The daffodils and crocus are blooming. Trees are budding and daylight saving time claimed its one-hour prize a couple of weeks ago. That means spring is here. And what better way to celebrate the changing of the seasons than to take in the sights, sounds and tastes of the seventh annual Spring Grüv at Canyons Resort. This year’s event, which runs from March 21 through March 30, will feature Jibbin’ for Juniors, live music by Steel Pulse, The Magic Beans and The Mother Hips, American Cancer Society’s Ski-lay for Life and the ever popular pond skimming, said Caitlin Martz, communications specialist for Canyons. "Spring Grüv is basically set up to celebrate spring in the Wasatch Back," Martz told The Park Record. "The weather is always perfect because the sun is shining and it’s tons of fun." The whole thing literally kicks off with Jibbin’ for Juniors on Friday, March 21. "This is a free mini park that has rails and boxes for what they call mini shreds on snowboards," Martz said. "Little kids band together for this little event at the resort’s ski beach. We usually feature Jibbin’ for Juniors throughout the winter and spring season as well, but this one on Friday is specifically held during Spring Grüv." 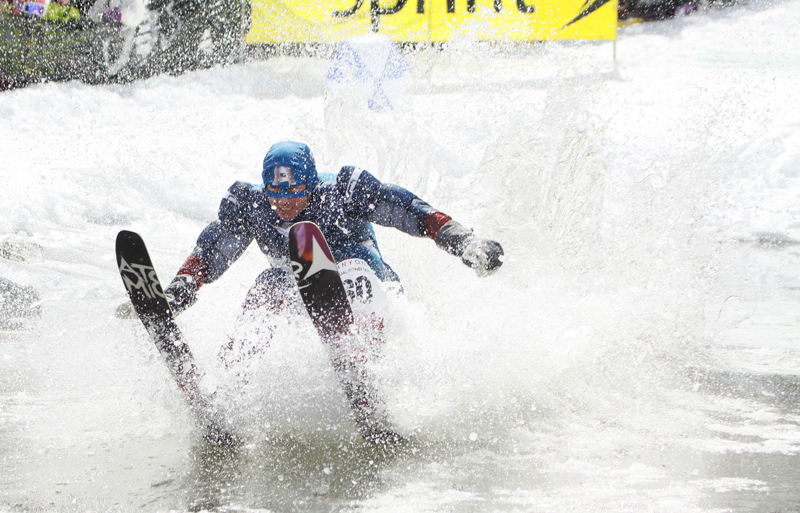 One of the biggest highlights of the weekend will be the pond skimming competition on Saturday. Pond skimming, now in its 18th year, features an array of daredevils who dress up in crazy costumes and try to ski or snowboard down the hill by Red Pine Lodge and across a 100-foot pond. "This is the greatest party in Park City," Martz said. "Whether they watch or participate, everyone has such a great time during this event." Throughout the years, people have dressed up in practical and not-so-practical outfits during this event. "In the past years, we’ve had a guy dressed up in bubble wrap, and last year someone built this whole wooden contraption that looked like an A-frame," Martz said. "He attempted to swing through the frame at the bottom of the hill and it was so funny." While Martz thinks those types of pond-skimming contraptions are clever, she really enjoys seeing costumes that are relevant to some of the crazy moments the public sees in popular culture. "I love how people dress to the big discussions of the year," Martz said with a laugh. "One year we had someone dress up as Tiger Woods and someone dress up as his ex-wife chasing him in a car. I’m sure we’ll have a Miley Cyrus and a wrecking ball appear this year." Registration is open to anyone ages 10 years and older and each year the pond skimming receives close to 100 entries. "We take registration in advance, and even if people preregister, they still have to show up between 9 a.m. and 10 a.m. at One Sweet Ride to check in," she said. "We hold a riders meeting at 11:45 a.m. and the actual contest starts at noon." During the contest a DJ will spin some tunes. The awards ceremony will begin at 2:30 p.m. Immediately following the ceremony, Grammy Award-winning reggae band Steel Pulse will perform. "The opening act will be Cody ChesnuTT," Martz said. "This is a huge show for us and it will be tons of fun." Spring Grüv continues Sunday with another concert by The Magic Beans, a band from Boulder, Colo., at the Resort Village at 3 p.m.
"After that, we’ll have more Spring Grüv activities that will be held every weekend until the end of March," Martz said. One of those is the Ski-lay for Life that is presented by the American Cancer Society on Saturday, March 29. "This event is based on the American Cancer Society’s Relay for Life, but on skis," Martz said. "It’s a ski and snowboard challenge that raises money for the American Cancer Society." The idea is to have individuals or teams raise funds and participate in a picture-taking, scavenger-hunt activity, she said. "We first hosted that last year and it was really fun," Martz said. "And we wanted to do it again this year." The concert that will follow Ski Lay for Life will be Brett Dennen, a singer and songwriter from Northern California. Ryan Montebleau will be the opening act. "Next to Steel Pulse, Brett is one of the bigger acts we are getting in for this season," Martz said. "All the concerts, by the way, have been programmed by Mountain Town Music. "One more thing to note," Martz said. "On Saturdays, we offer free Saturday S’mores, which are free s’mores that are offered to any of our guests who are siting on our Umbrella Bar Deck in the afternoon, close to 3 p.m."
"The barbecues aren’t specifically Spring Grüv events, because we do those throughout the season, but some of them just so happen to coincide with this year’s events," Martz said. In addition to the live music and interactive events, this year’s Spring Grüv will feature an appearance by Canyons’ Avalanche Dogs at the Ski Beach on Wednesday, March 26, at 4:30 p.m.
"We have a team of seven avalanche dogs, including a new puppy named Alley," Martz said. "She’s a darker lab mix and she’s the cutest thing ever. We just got her a month ago." Closing the 2014 Spring Grüv on Sunday, March 30, will be the Youth Sports Alliance Farewell to Winter scavenger hunt. Teams of four or more will solve clues across the mountain. In order to participate, players must have an active EpicMix account and a device for taking photos. The cost to enter is $25 for Epic Pass or day pass holders and free for YSA day pass holders. The entry fee includes a lunch voucher. Wrapping up the day will be a concert by local favorites Holy Water Buffalo at 3 p.m. and headliners The Mother Hips at 4:15 p.m.
"That will also be a fun show," Martz said. "We have so much planned for this year’s Spring Grüv and we hope people come to celebrate with us." Canyons Resort will celebrate the 18th annual Spring Grüv from Friday, March 21, through Sunday, March 30. Most of the events are free and all are open to the public. For more information, visit http://www.canyonsresort.com .